In September, 1963, Buell Frazier began work at the Texas School Book Depository in Dallas. The following month, Ruth Paine, a neighbour of Linnie Mae Randle, told her that Lee Harvey Oswald was going to work at the same building. The two men became friends and Frazier agreed to give Oswald a lift to work when he was staying at Paine's house in Irving. On 22nd November, 1963, Buell Frazier gave Oswald a lift to the Texas Book Depository. He told the Warren Commission that Oswald took a package into work that day that he claimed contained curtain rods. In his book The Kennedy Conspiracy, Anthony Summers, points out: "Ironically, it was Frazier and his sister who created a slight doubt that Oswald had, in fact, been carrying the murder weapon rather than his "curtain rods." Both insisted Oswald's parcel was a good eight inches shorter than the disassembled Mannlicher-Carcano. Frazier demonstrated this by showing that Oswald could not physically have carried a 35-inch rifle tucked into his armpit with the base cupped in his hand, as Frazier remembered." A group of Dallas Police Department detectives, including Will Fritz, Seymour Weitzman, Roger Craig, Eugene Boone and Luke Mooney searched the Texas School Book Depository soon after the assassination of John F. Kennedy. On the sixth floor they discovered a rifle hidden beneath some boxes. The detectives identified it as a 7.65 Mauser. District Attorney Henry M. Wade, in a television interview, told the nation that the rifle was a Mauser. It was the FBI who announced that the officers had been mistaken. According to them it was a 6.5 Mannlicher-Carcano, an Italian bolt-action rifle used in the Second World War. All the detectives agreed to change their mind about the rifle except Roger Craig. The FBI discovered that the rifle had been purchased from Klein's sporting goods in Chicago on 12th March, 1963, by a man using the name, A. J. Hiddell. When Lee Harvey Oswald was arrested he was carrying a forged identity card bearing the name Alek J. Hiddell. A palm print taken from the barrel of the rifle was identified as belonging to Oswald. taken on 31st March, 1963. 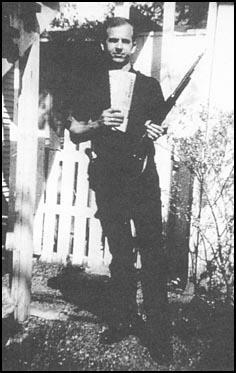 It was during the month of March 1963 that Oswald obtained a rifle and a handgun, if we can rely on Marina's testimony. Not that it is greatly to be relied upon, as we saw earlier in discussion relating to an incriminating photograph in which both weapons were flaunted. Curiously, the weapons were bought, separately, under the name of A. J. Hidell, an alias which counted for little with Oswald other than in connection with the orders for the firearms. There was no reason whatever why Oswald should not have simply walked into a shop and bought what he wanted, obtaining the advantage and satisfaction of seeing what he was buying. Texas law imposed no control over the purchase of such weapons. There would have been very little - in fact virtually no - chance of Oswald being identified as the purchaser of the firearms had he bought them over the counter. So why did he buy them by mail order under this assumed name? There is strong evidence that the name was meaningful to those involved in intelligence. Army Intelligence, for instance, was known to have had a file on A. J. Hidell, the contents of which, significantly, were destroyed before it could be acquired by investigators. A. J. Hidell may not have been the only name on intelligence files which stood for Lee Harvey Oswald, either. Harvey Lee Oswald as Oswald Lee Harvey are but two other possibilities which would have allowed the CIA and FBI, when asked, to say they had no such person as Lee Harvey Oswald working for them. If Oswald bought the rifle and handgun, there is every reason to believe he would buy them at the behest of his CIA masters and was told to buy those specific weapons, told to buy them by mail order, and told to buy them under the name A. J. Hidell. Why is Matthew Smith surprised that Lee Harvey Oswald apparently purchased the Mannlicher-Carcano by mail order? First press accounts quoted various members of the Dallas police force as saying the assassin's weapon was a .30-caliber Enfield and a 7.65mm Mauser. One Secret Service man said he thought the weapon was an "Army or Japanese rifle" of .25 caliber. The same accounts reported that the rifle was found on the second floor of the building by a window, in the fifth-floor staircase, by an open sixth-floor window, and hidden behind boxes and cases on the second or sixth floors. It was not until the FBI said it had discovered that Oswald had purchased an Italian-made 6.5mm rifle from a Chicago mail-order house that the confusion was dispelled. Then all accounts and all sources agreed: The former .30 caliber-Enfield-7.65 Mauser was now a 6.5mm Italian-made rifle with telescopic sight. It was also at this time that all sources began agreeing that the gun had been found on the sixth floor - though some still held out for the open-window location, while others argued for the buried-behind-the-boxes theory. We did not at that time have a very clear idea of the precise number of seconds within which the shots had occurred, but we were uneasy about anyone's having got off the reported three shots with a bolt-action rifle from that distance at a target moving 12 yards a second with that accuracy and quickly enough to have created such confusion about who got hit first, the President or the Governor. On November 25 The New York Times reported that "a group of the nation's most knowledgeable gun experts, meeting in Maryland at the time of the shooting agreed that, considering the gun, the distance, the angle and the movement of the President's car, the assassin was either an exceptional marksman or fantastically lucky in placing his shots." The Times account does not indicate whether the experts also considered the extreme rapidity with which the shots were fired. Others did not agree with this expert. The Italian newspaper Corriere Lombardo of Milan said, as reported in the same The New York Times story, that if the Model ' were used and that if more than one shot had ben fired "there must have been a second attacker." In Vienna, the Olympics champion shot, Hubert Hammerer, said that the initial shot could have been made under the conditions in Dallas when Mr. Kennedy was killed, but he considered it unlikely that one man could have triggered three shots within five seconds with the weapon used. All these judgments were made on the theory that the shots were fired as the Presidential car sped away from the gunman, with the gunman having to allow only for the forward movement of the car. This supposition, of course, takes no account of the marksman himself having to move in order to swing the gun through an arc of 180 degrees. What evidence do these journalists provide that suggests that Lee Harvey Oswald may not have been the owner of the rifle that was used to kill John F. Kennedy? (E3) Seymour Weitzman, interviewed by Joe Ball on behalf of the Warren Commission on 1st April, 1964. What evidence is there that Seymour Weitzman changed his mind about the rifle he found in the Texas Book Depository? 7.65 Mauser. Deputy Sheriff Eugene Boone found the rifle following the movement of book boxes by Deputy Sheriff Luke Mooney and called Deputy Constable Seymour Weitzman to witness his discovery. Another Deputy Sheriff, Roger Craig, was thereabouts and he saw the gun and heard the conversations of the others. The officers had no doubts about their identification and affidavits were drawn up by Boone and Weitzman, who described the weapon in detail, noting the colour of the sling and the scope. Police Captain Will Fritz was also present at the scene and he, also, is claimed to have agreed that the rifle was a 7.65 Mauser. District Attorney Henry M. Wade, in a television interview, referred to the sixth-floor discovery and quoted the weapon as a Mauser, a statement picked up by the press and reported widely. Following the finding of the gun, however, it was collected by Lieutenant. C. Day and taken to Police Headquarters, where it was logged as a 6.5 Mannlicher-Carcano, an Italian carbine, bearing the serial number C2766. Mannlicher-Carcano Italian carbine No. C2766, it was claimed, belonged to Lee Harvey Oswald. Young Roger Craig, who saw and heard all that had gone on in the Book Depository, refused to concede that he had been mistaken, or even that he might have been. Who found the rifle in the Texas Book Depository? Did they all agree that it was a 7.65 Mauser? How many changed their minds about the make of the rifle? Witnesses at the scene of the assassination saw a rifle being fired from the sixth-floor window of the Depository Building, and some witnesses saw a rifle in the window immediately after the shots were fired. The nearly whole bullet found on Governor Connally's stretcher at Parkland Memorial Hospital and the two bullet fragments found in the front seat of the Presidential limousine were fired from the 6.5-millimeter Mannlicher-Carcano rifle found on the sixth floor of the Depository Building to the exclusion of all other weapons. The three used cartridge cases found near the window on the sixth floor at the southeast corner of the building were fired from the same rifle which fired the above - described bullet and fragments, to the exclusion of all other weapons. The windshield in the Presidential limousine was struck by a bullet fragment on the inside surface of the glass, but was not penetrated. There is no credible evidence that the shots were fired from the Triple Underpass, ahead of the motorcade, or from any other location. (2) The weight of the evidence indicates that there were three shots fired. (3) Although it is not necessary to any essential findings of the Commission to determine just which shot hit Governor Connally, there is very persuasive evidence from the experts to indicate that the same bullet which pierced the President's throat also caused Governor Connally's wounds. However, Governor Connally's testimony and certain other factors have given rise to some difference of opinion as to this probability but there is no question in the mind of any member of the Commission that all the shots which caused the President's and Governor Connally's wounds were fired from the sixth floor window of the Texas School Book Depository. The Mannlicher-Carcano 6.5 - millimeter Italian rifle from which the shots were fired was owned by and in the possession of Oswald. Oswald carried this rifle into the Depository Building on the morning of November 22, 1963. Oswald, at the time of the assassination, was present at the window from which the shots were fired. Shortly after the assassination, the Mannlicher-Carcano rifle belonging to Oswald was found partially hidden between some cartons on the sixth floor and the improvised paper bag in which Oswald brought the rifle to the Depository was found close by the window from which the shots were fired. Based on testimony of the experts and their analysis of films of the assassination, the Commission has concluded that a rifleman of Lee Harvey Oswald's capabilities could have fired the shots from the rifle used in the assassination within the elapsed time of the shooting. The Commission has concluded further that Oswald possessed the capability with a rifle which enabled him to commit the assassination. What evidence does the Warren Commission Report provide to support the theory that Lee Harvey Oswald used a Mannlicher-Carcano rifle to kill President Kennedy? Interest in Paine's garage, for example, derives from Oswald having stored his Mannlicher-Carcano, wrapped in a blanket, in that place. But no remnants of having been wrapped in a blanket were ever discovered on the alleged assassination weapon - not the least hairs or fibers - which is very curious, indeed, had the weapon actually been stored there. The alleged instrument, a cheap, mass-produced World War II Italian carbine, has a muzzle velocity of around 2,000 fps, which means that it is not a high-velocity weapon. Since the President's death certificates (1963), The Warren Report (1964), and even more recent articles in The Journal of the American Medical Association (1992) report that JFK was killed by high velocity bullets, it follows that he was not killed by Oswald's weapon, thereby greatly reducing interest in Mrs. Paine's garage. Why does James H. Fetzer believe that Mannlicher-Carcano rifle was not used to kill John F. Kennedy? Ruth Paine was at home when it happened... a mother of two living in suburbia. "It's very hard for me to talk about," she says. Her role in history completely by accident. She would later become one of the key witnesses for the Warren Commission, a panel assigned to investigate the President's assassination. "I met Lee and Marina at a party in Dallas," Ruth says. Lee Harvey Oswald and his wife Marina were moving to Texas. Ruth agreed to let Marina - a Russian immigrant - live with her while Lee stayed in a separate apartment... only coming by on the weekends. "I did not know he had a gun, although Marina did," Ruth says, "and, in fact, it was stored in my closet. On the afternoon of the assassination, six Dallas officers appeared at the door and asked if he has a gun and I said, no.'" The only time Lee ever came by during the week - the day before the assassination. What Ruth didn't know was the gun allegedly used to kill the president was stored inside her garage. Where, according to Ruth Paine, did Lee Harvey Oswald hide his Mannlicher-Carcano rifle. It seemed evident that we should try to establish the ease or difficulty of that rapid-fire performance. Hence, our next question: How fast could that rifle be fired? Oswald's rifle was test-fired for the Warren Commission by FBI and military marksmen. The rate of fire for this bolt-action rifle and its accuracy against a moving target were critical to the Commission's case against Oswald. And yet, incredibly, all tests for the Commission were fired at stationary targets. The FBI won't comment on why. Did Oswald own a rifle? He did. Did Oswald take a rifle to the Book Depository building? He did. Where was Oswald when the shots were fired? In the building, on the sixth floor. Was Oswald's rifle fired from the building? It was. How many shots were fired? Three. How fast could Oswald's rifle be fired? Fast enough. What was the time span of the shots? Seven or eight seconds. Did Lee Harvey Oswald shoot President Kennedy? CBS News concludes that he did. Does Walter Cronkite believe that Mannlicher-Carcano rifle was used to kill John F. Kennedy? We have already noted the mysterious circumstances surrounding the alleged discovery of Bullet 399 on Governor Connally's stretcher. We shall now examine the medical and ballistics evidence to see if this bullet could have caused the governor's wounds. Bullet 399 is a copper-jacketed Mannlicher-Carcano 6.5 mm. bullet. The copper jacketing is completely intact. Only the very base of the bullet contains any deformities. The base is slightly squeezed and flattened. About 1.5 to 2.5 grains of lead are missing from the lead core at the bottom of the missile. The bullet was ballistically traced to Oswald's rifle. The grooves and lines on the copper jacketing, caused by the interior of the rifle barrel, are completely intact, even under microscopic examination. Connally, severely damaged two bones, and emerged virtually intact, losing only 1.5 to 2.5 grains of its original weight, has led numerous critics to dispute the claim. The critics contend that no bullet could possibly have caused such damage and emerge intact. 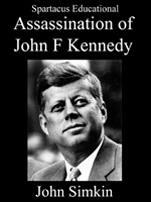 Why does Michael Kurtz doubt that Bullet 399 wounded President Kennedy and Governor Connally? Since the Warren Commission elected not to extend the time frame in this way, they concluded that the entire assassination took place between frames Z-210 and Z-313, or a time span of 5.62 seconds, just enough time to get off three shots. Any competent gunman would have had the rifle already cocked for the first shot, in which case the bolt would have been operated only twice and the absolute minimum time expended operating the bolt would have been 4.6 seconds. But if four shots were fired, the rifle would have been cocked three times requiring 6.9 seconds. So, if four shots were fired there must have been more than one gunman at Dealey Plaza. Of course, if the Commission had accepted the possibility that the first shot was fired through the tree at Z-166, then their estimate of 5.62 seconds could be extended by 2.4 seconds to about 8 seconds, more than enough time for a lone gunman to get off even four shots. What evidence does Ronald F. White provide to suggest that the Warren Commission Report was wrong to suggest that Lee Harvey Oswald was the only gunman involved in the killing of President Kennedy? A further issue concerns reports of the appearance of cerebellar tissue in the occipital wound. This was first reported "live" as observations by an orderly, and by a nurse, both of whom were in the surgery where attempts to resuscitate the president were conducted prior to his death. I didn't give any credibility to those stories and dismissed them from my focus at the time, attributing what I thought must be mistaken identification of cerebellum to a likely lack of familiarity with neuroanatomy by two non-medically trained individuals. It would be easy to assume cerebellum in looking at macerated cerebral tissue protruding from a bloody wound. But since then, around six reputable physicians who saw the president at that time have testified that cerebellum was extruding from the wound at the back of his head. That is an important clue, indicating that something must have burst into the posterior fossa with sufficient force to uproot the cerebellum and blow a substantial hole through the heavy, covering, well-anchored, tentorium, which separates cerebellum from the main chamber of the skull. Dr. Robert Livingston does not believe that President John Kennedy was killed by a bullet from the Mannlicher-Carcano rifle? Why? (E12) Henry Hurt, Reasonable Doubt: An Investigation into the Assassination of John F. Kennedy (1986). One of the enduring oddities of the evidence found in the assassin's lair is the discovery of the three cartridge shells ballistically linked to the Oswald rifle. Those shells were not scattered widely as one would expect them to be if ejected from a rifle in the normal fashion. Moreover, two of them were only inches apart. Another curious point is the failure by investigators to find a single Mannlicher-Carcano cartridge other than those, including a live round still in the rifle, discovered at the scene. No extra cartridge was ever found on Oswald or in his possessions. No evidence was found that he ever purchased ammunition at all. If he was the assassin, his only ammunition was at the scene - the cartridge shells lined up as evidence in the assassin's lair. There is no official explanation as to where Oswald supposedly got his four cartridges. As for the Mannlicher-Carcano that was officially established as the Oswald assassination rifle, the ancient, bolt-action weapon was one of the worst possible selections for such skilled shooting. There is no indication that Oswald knew much about guns, and he was never regarded as a superlative marksman while he was in the Marine Corps. Yet he is credited with a combination of shooting skills on November 22 that has never been matched in repeated government tests by the most proficient riflemen in the United States. Moreover, there is no evidence that the Mannlicher-Carcano was even fired on the day of the assassination. Why does Henry Hunt have doubts about whether the Mannlicher-Carcano was used to kill President Kennedy? Joseph Ball: When you got in the car did you say anything to him or did he say anything to you? Buell Wesley Frazier: Let's see, when I got in the car I have a kind of habit of glancing over my shoulder and so at that time I noticed there was a package laying on the back seat, I didn't pay too much attention and I said, "What's the package, Lee?" And he said, "Curtain rods," and I said, "Oh, yes, you told me you was going to bring some today." That is the reason, the main reason he was going over there that Thursday afternoon when he was to bring back some curtain rods, so I didn't think any more about it when he told me that. Joseph Ball: What did the package look like? Buell Wesley Frazier: Well, I will be frank with you, I would just, it is right as you get out of the grocery store, just more or less out of a package, you have seen some of these brown paper sacks you can obtain from any, most of the stores, some varieties, but it was a package just roughly about two feet long. Joseph Ball: It was, what part of the back seat was it in? Buell Wesley Frazier: It was in his side over on his side in the far back. Joseph Ball: How much of that back seat, how much space did it take up? Buell Wesley Frazier: I would say roughly around 2 feet of the seat. Joseph Ball: From the side of the seat over to the center, is that the way you would measure it? Buell Wesley Frazier: If, if you were going to measure it that way from the end of the seat over toward the center, right. But I say like I said I just roughly estimate and that would be around two feet, give and take a few inches. Joseph Ball: How wide was the package. Buell Wesley Frazier: Well, I would say the package was about that wide. Joseph Ball: How wide would you say that would be? Buell Wesley Frazier: Oh, say, around 5 inches, something like that. 5, 6 inches or there. I don't. Joseph Ball: The paper, was the color of the paper, that you would get in a grocery store, is that it, a bag in a grocery store? Joseph Ball: What did he do about the package in the back seat when he got out of the car? Buell Wesley Frazier: Like I say, I was watching the gages and watched the car for a few minutes before I cut it off. Buell Wesley Frazier: He got out of the car and he was wearing the jacket that has the big sleeves in them and he put the package that he had, you know, that he told me was curtain rods up under his arm, you know, and so he walked down behind the car and standing over there at the end of the cyclone fence waiting for me to get out of the car, and so quick as I cut the engine off and started out of the car, shut the door just as I was starting out just like getting out of the car, he started walking off and so I followed him in. According to Buell Wesley Frazier, what did Lee Harvey Oswald say was in the brown package? The Warren Commission would dismiss the curtain rods factor as a fabrication, quoting Oswald's landlady as saying his apartment needed neither curtains nor rods and saying that no rods had been found at the Depository. Yet photographs of curtain rods have turned up in the Dallas police files on the assassination. And a press photographer. Gene Daniels of the Black Star agency, has recalled how Oswald's landlady asked him not to take photos in Oswald's room until she had "the curtains back up." In fact, he took pictures as curtain rods were hammered into position over the uncurtained windows. This was less than twenty-four hours of the assassination. The curtain rods story, then, may not have been a total fiction. In custody, however, Oswald denied having told Frazier he intended fetching rods for his rented room - and even insisted that he had not carried a long package, or placed it on the back seat of Frazier's car, on the morning of the murder. Both denials are implausible, because there is no reason to doubt the word of either Frazier or that of his sister, who also saw Oswald with the long package. Ironically, it was Frazier and his sister who created a slight doubt that Oswald had, in fact, been carrying the murder weapon rather than his "curtain rods." Both insisted Oswald's parcel was a good eight inches shorter than the disassembled Mannlicher-Carcano. Frazier demonstrated this by showing that Oswald could not physically have carried a 35-inch rifle tucked into his armpit with the base cupped in his hand, as Frazier remembered. He could have done so only if the package was shorter. Yet the Commission felt Frazier and his sister were mistaken, and to bolster their theory that Oswald did carry the rifle to the Depository, they had the 38-inch paper bag which had been found by the window on the sixth floor. The bag was firmly linked to Oswald by a fingerprint and a palm print, although it was free from any scratches or oil from the metal parts of a rifle. This is rather strange, because the Mannlicher-Carcano was oiled when found. The Warren Commission - and the Assassinations Committee in 1979 - concluded that Oswald did carry the rifle to work. Certainly, he carried something to work and was evasive about it when questioned. Why does Anthony Summers doubt that Lee Harvey Oswald took a Mannlicher-Carcano rifle into the Texas Book Depository on 22nd November, 1963? When one piece of evidence that favors Lee Harvey Oswald's guilt is piled atop another, and another, and another.... I just was curious as to how many pieces of individual evidence that show Oswald killed JFK in 1963 it takes to sway a person away from the notion of conspiracy? Or, if nothing else, sway that person away from the "Oswald is completely innocent" claims? From everything I can see, it's a veritable mountain of "Oswald Is Guilty" evidence (both circumstantial and physical). And not a single speck of it has been shown to be refutable with 100% absolute certainty. Does the average researcher just simply ignore all of the evidence that supports Oswald's lone guilt (and every bit of hard evidence supports it), or is the idea of "it must have been a conspiracy" so ingrained into subsequent generations of people since the event took place that they feel they have no choice BUT to go with the flow and believe the CTers? For I ask you HOW could ALL of the following evidence against Oswald have been either fabricated, planted, distorted, or in some manner faked?! There's just TOO MUCH stuff here on the "Oswald Did It" table to ignore! Granted, I'd agree that perhaps one or two of these things could have been manufactured to set up a patsy. But ALL of these items?! And complete silence be maintained by the many, many operatives who must certainly have been involved in the acts themselves and ensuing 40-year cover-up?!! Common sense (to me) dictates otherwise. And the "otherwise" leads anybody who isn't prone to cry "Conspiracy!" at every turn in the road to finally envision the fact that LHO was a lone nut who DID indeed pull off what the majority of people say couldn't happen in a million years.....He murdered John F. Kennedy without the assistance of others in late 1963 in Dallas, Texas. 1.) Oswald definitely owned the rifle found on the 6th floor of the TSBD on 11/22. 2.) He also definitely owned the handgun that was shown to have been used in the Tippit killing. 3.) Marina admits to having taken pictures of Lee with these weapons on his person. 4.) Wesley Frazier observed Oswald take a package into the Depository on the morning of November 22nd, 1963. 5.) Oswald's claim of "curtain rods" within the package cannot be supported at all. His room needed no curtains, nor rods, and NO such rods were ever found in the TSBD or at 1026 N. Beckley. Nor was LHO seen carrying any type of package (rods or otherwise) out of the building after leaving work (unannounced to anyone) after the assassination. It can therefore be reasonably assumed that no rods ever existed. 6.) Oswald was seen working on the sixth floor that morning. Co-workers sent the elevator back up to Oswald on the 6th floor shortly before the assassination. 7.) Oswald's palmprint found on Carcano rifle. .... But, of course, this print is really just a "bonus" for the DPD in linking LHO to the weapon. For even without it, it's glaringly obvious that the weapon was Oswald's. It was proved the alias, Alek/Alex Hidell, was actually Oswald himself; and the order form from Klein's to purchase the mail-order rifle was positively proven to have been in Oswald's handwriting, and sent to a Dallas P.O. Box that was used by him. Obviously, just LHO's owning the rifle doesn't prove he pulled the trigger. But doesn't just plain ordinary garden-variety logic dictate (with a pretty good percentage of probability) that it was the owner of said weapon, a Mr. Lee H. Oswald, that fired the shots on 11/22. The alternative is to believe that Oswald, for some unknown reason, handed over his Carcano to someone else for the purpose of using it. Why would he knowingly have done this idiotic act, knowing full well what might be the implications of doing so?! 8.) Not ONE SPECK of any bullets/bullet fragments/bullet shells OTHER THAN OSWALD'S 6.5 MM MANNLICHER-CARCANO were discovered anywhere in Dealey Plaza, the limousine, the TSBD, Parkland Hospital, or in the victims. This one, to me, is simply impossible for conspiracy advocates to overcome, IF there had been (as some claim) up to 3 firing teams and 6 shots fired in DP on Nov. 22nd. HOW could every single scrap of ballistics evidence be completely eradicated from the 2 (or more) non-Oswald weapons almost immediately after the event?! Couldn't have been accomplished by even Kreskin!! .... Plus: This massive task of removing all non-Oswald wounds & bullets would most certainly have had to include the many doctors who worked on BOTH the President and Gov. Connally at Parkland. PLUS it would include the multitude of people who observed the body at Bethesda (unless you subscribe to the totally-implausible accounts of body-altering and all that business aboard AF1, or elsewhere before the body got to Washington. Again, even Kreskin would be amazed by such incredible sleight-of-hand). .... ALL ballistic evidence was traced back to being consistent with the weapon owned by Lee H. Oswald. The probability of this occurring IF there were multiple guns firing at the motorcade is probably so low to be considered virtually impossible. 9.) Over 90% of the Dealey witnesses said shots came from behind the President, in the direction of the School Book Depository building. NINETY per cent plus! Now, HOW could THAT MANY people all be mistaken. Are we to actually believe the much-fewer number of 9%-10% of ear/eyewitnesses that claimed to hear shots from the front? That is illogical on its face. If 9 out of 10 people say it happened a certain way....WHY would the claims of the minority 10% be taken as gospel? Makes no sense! .... In addition, over 95% of this 90%+ claim there were EXACTLY three shots. No more, no less. And three spent shells (co-incidentally?) were found in the "sniper's nest" on the sixth floor. Now, do we ignore the overwhelming 95% of earwitnesses on this crucial point? Or do we stretch the imagination and for some reason trust the lowly number of 5% of the people who claim 4 or more shots? 10.) Oswald only ONCE made a weeknight visit to Irving. That just happened to be on Thursday, November 21, 1963. His rifle is found missing the following day. 11.) Oswald left behind, presumably for wife Marina, his wedding ring and just about every dime he had to his name ($100+), on the morning of 11/22. Logic dictates that he felt he may not return. 12.) Oswald was the only Depository employee to leave work prematurely on 11/22. Why do you suppose this was? The day was only half over. 13.) Oswald, in flight, shoots & kills DPD Office J.D. Tippit (multiple witnesses confirm it was Oswald, with very few variations of description). Once more, are we to accept the minority of people who state: "It was a larger man" or "There were two people", rather than believe the majority of people who claim, uncategorically, that OSWALD SHOT TIPPIT?! Why does the minority get such a benefit of the doubt in so many aspects of this case....while the huge, eye-popping majority (which favor the Oswald-Did-It stance) is subject to such scrutiny. By sheer numbers, wouldn't the lowly 5% or 10% on this & that be scrutinized with a far more wary eye? I certainly would think so. 14.) WHY does Oswald kill Officer Tippit IF he's innocent of another crime just minutes earlier in Dealey Plaza? Answer: He would have no such reason to do so. 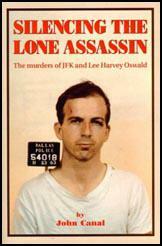 If the Tippit shooting isn't one of the biggest reasons to shout from the rooftops "Oswald did it!! ", then I don't know what would be. 15.) Oswald, just days after acquiring his Carcano weapon, attempts to murder retired General Edwin Walker in Dallas, in April of '63, barely missing out on killing his third victim during the year 1963. Marina Oswald herself testifies that "Lee told me...he just shot Walker." The Walker bullet is proven to have come from the Oswald rifle (consistent with being fired from a 6.5 MM Carcano). ..... Another KEY fact is the Walker attempt, as I think any reasonable person looking at the case objectively would concur. For, it displays in Oswald a definite tendency toward violent action on his part during the months leading up to November 22nd. To me, it's not a wild stretch of one's imagination to think that if this guy is willing to bump off Walker, then he might just set his sights a little higher when the perfect opportunity presents itself 7 months later. The fact that Oswald was a kind of loner, oddball, and rejected authority at just about every turn in life cannot be underestimated when talking of motive. He probably hated America (in general terms) for not being able to just come and go as he pleased to Russia and Cuba whenever it pleased his self-serving self in the months just prior to November 22. As a former Marine acquaintance of Oswald's once said: "He always thought he was a little better than everyone else." This statement speaks volumes, in my opinion, when gazing into Oswald's background and possible motive in the JFK murder. 16.) It was PROVEN, no matter what anybody WANTS to believe to the contrary, that three shots COULD be fired in the allotted timeframe from the Oswald rifle. The probability that Oswald had, in fact, 8.1 to 8.2 seconds to accomplish the shooting further increases the likelihood that Lee could have performed the deed. IF you believe the first (missed) shot hit a tree branch and ricocheted to strike James Tague by the underpass at approx. Frame 160 of the Zapruder film (as I, of course, do), then the total time between shots #1 and #3 increases to more than eight seconds, much more than the minimum required of 2.3 seconds (times two) to get off the three shots. 17.) Try as the CTers might, the Single Bullet Theory has still not been proven to be an impossibility. The Zapruder film shows that the SBT is more-than-likely the correct scenario of events that day. Kennedy & Connally are reacting to their initial wounds at virtually an identical time, at Z-Frame 224. Unfortunately, that damn Stemmons sign is blocking our view during what might be a critical point on the film. It can therefore NEVER be determined by anybody whether JFK was reacting to his throat/neck wound at a frame earlier than Z224. But, based on the available evidence, the SBT (judging by the reactions of the two victims in the limo) most certainly cannot be said to be false. 18.) While viewing the Zapruder film, I cannot see how anybody can say that the BACK of President Kennedy's head is blown away as a result of the head shot. It seems quite obvious while watching and freezing the film at various post-Z313 frames, that the entire rear portion of JFK's head remains intact throughout the shooting. The RIGHT-FRONT portion of his head is blown apart. Isn't it obvious that it's the FRONTAL portion of his skull that is being displaced by the swiftly-moving projectile? And if so, doesn't this demonstrate the actions of an object that's just been struck from BEHIND, not from the front? For, if shot from the grassy knoll (front right), WHY isn't there evidence on the Z-Film of massive head damage on the President's LEFT-REAR side of the head? Bullets explode out the EXIT wounds, don't they? 19.) It was also proven that Oswald could have indeed trekked, in 90 seconds, the distance across the sixth floor and descended the 4 stories in time to have been seen on the building's second floor. Oswald was a thin, lean-enough sort of 24-year-old lad (who had by November 22nd become used to lifting heavy objects around all day long on a two-wheeled cart at his job at the Depository). To me, it doesn't seem like a fairy tale to say that he would have been able to hide the weapon quickly and then negotiate the fours flights of stairs within a 90-second timeframe and NOT be out of breath, so he could encounter Officer Marrion Baker and Roy Truly on the second floor in a relatively composed and unrattled state at 12:31-12:32 PM (CST) on November 22nd. I wonder, too, considering what had just happened outside on Elm Street, just exactly how much detailed attention Mr. Baker or Mr. Truly might have been paying to Lee Oswald's "breathing" during that very brief meeting in the 2nd-floor lunchroom. I'd be willing to bet neither paid an ounce of attention to a detail like that at that exact stressful moment. Lee was just another employee in the lunchroom for all those two knew at 12:32 PM. Do you agree with David Von Palin that: "From everything I can see, it's a veritable mountain of "Oswald Is Guilty" evidence (both circumstantial and physical). And not a single speck of it has been shown to be refutable with 100% absolute certainty."? David, I take it that since you have listed your irrifutable evidence, you are welcoming challenge? Let me travel to the darkside (to the defense table) for a moment and see what we come up with. I would not challenge this, but I do question why someone who is not suffering from retardation would choose such a rifle at this price through mail order when they could pick up a Mauser lets say over the counter in Texas without paperwork for a similar price. I will not challenge him owning the .38 he was picked up with but be careful on stating it was shown to be linked to the Tippit Killing. Take another look at the ballistics. Marina did not know a rifle from a shotgun and the photos she admitted taking were from a different angle in the backyard photos. So it must have been the Carcano he was carrying, eh. And who exactly saw Oswald leave the building empty handed? Careful with the term "shortly before the assassination. Vague and challenging as I will address below. In regards to the palmprint, it was found on the underside of the barrel that was covered by the wood forend that is only exposed after the forend/stock group is removed. I will not refute that Oswald ordered the rifle or even possessed it at one time so having his partial palm print in this location simply shows that he had taken the rifle down at one time, and obviously not on the sixth floor of the TSBD on 11/22/63. Why were no other identifiable prints found on the weapon. The excuse given was the wood would not hold prints but we are led to accept that the gunsteele would. Placed immediately into a controlled environment, these prints would last less than 24 hours with the methods they used for lifting in 1963. This rifle was kept on the 6th floor of the TSBD for over an hour and then paraded through the halls and at press conference at DPD before the print was lifted. You state it would be idiotic for him to loan the rifle out, but accept it normal that he would leave it behind on the sixth floor after the shooting? There is an issue called crime scene preservation in regards to the plaza and the limo. Neither was followed. The plaza was immediately opened up after the assassination and there is no record of any ballistic material located, not even the governments errant round that struck the curb and wounded Tague. There are photos of the limo being washed out with a sponge and bucket at Parkland. The Parkland Doctors do not do any procedure that would allow discovery of such material. There are reports from witnesses at Bethesda of a bullet being located and also FBI Agent O'neil taking possession of a missle from the body of the president. Where is either of those. I move to strike this entire issue of ballistic evidence. Please cite your source on this. Stewart Galanor in his book Cover-Up cites 216 witnesses where of the 216, 212 are documented in the WC hearings and evidence while another four are from Mark Lane's interviews. Of those 216, they break down the shot origin as follows: TSBD=47, Knoll=53, TSBD&Knoll=6, Elsewhere=5, Not asked=70, Could not determine location=35. Now how are you getting 90+%? Careful here. How long had he worked at the TSBD before the assassination? Does that lighten the blow here. Just because the rifle was found missing the following day, doesn't mean it was there on the 21st even the previous week. Can you give me a timeline on when it was last seen in the Payne garage? And this is the same man who walked away from the shooting and would have to survive on nothing after the shooting. If you were going to take on this task, wouldn't you have some finances with you for a getaway for a period? Now what you are reporting sounds stranger than ever. Actually there were seven not accounted for and four were found to be off work that day. Still leaves us three, but Oswald became the immediate suspect anyway. Dissenting witnesses leave reasonable doubt and then we add the rediculous line-up he was in, which wouldn't get into a court of law. Still haven't proven by any stretch, let alone a reasonable doubt that he killed Tippet. Take another look at the Walker shooting and see how it compares on degree of difficulty with the Kennedy Assassination. It still amazes me that people are accepting this. Who couldn't fire three shots in 5.4 seconds with a bolt action rifle. The problem is, doing so with accuracy. Hathcock and his crew couldn't, nor could anyone else with the same degrees of difficulty of moving target, elevation, etc.. When researchers show that this could not be done, the LNers suddenly come up with another 3 seconds to see if it will fly. But has it been proven to work? Has it ever been duplicated? The proof lies in the prosecution, and it is a joke. Take another look at the breakdown GIFs of Zapruder Film and other films on the forum and the back of the head blowout is visible. I do agree that the knoll shot would result in damage to the left rear, but who says the shot from the front came from the knoll? Others do, I don't and I have explained my shot origin. In #9, I refer to Stewart Galanor's collection of witness material on shot origin. What needs to be considered is that many of the witnesses that are put into the Knoll catagory actually say the area of the knoll and overpass. Before you accept a shot from the rear, take a look at the test skulls of CE861 and CE862. These are the best of six that were shot. Note the frontal lobe damage that is inconsistent with Kennedy. Also take a look at Dr. Latimer's skull that he felt was consistent. And how did Oswald make it down to the 2nd floor lunchroom. The elevators were on the fifth floor when Baker got to the elevator bank. There were SF employees on the stairs that did not see Oswald or anyone else descend them. I hope you understand that if you are going to prosecute this man, you need to prove beyond a reasonable doubt. Haven't even come close here. And I haven't mention the GSR tests on his cheek that were negative. Kind of tough to fire a rifle with a cheek weld and not get a positive test. That alone says enough. Who is the most convincing: David Von Palin or Al Carrier?